31.03.2013 (Hvino News). The fourth festival of young wine will take place in Tbilisi on May 11. 30.03.2013 (Hvino News) Members of the World Wine Trade Group (WWTG) agreed on a new Treaty Protocol on Wine Labeling in New Zealand last week. Georgia is member of WWTG, topether with New Zealand, Argentina, Australia, Canada, Chile, South Africa and the United States of America. In 2007, the WWTG negotiated a Treaty on Wine Labelling which set new standards in the field. The Protocol takes this further by requiring participant countries to allow the importation and sale of wine from other signatories, provided it meets minimum standards for labeling (relating to alcohol tolerance, variety, vintage and wine region), and the exporting country’s laws and regulations. As per the New Zealand government’s statement following the agreement, the key benefits of the Protocol for producers are that, once in force, it should provide enhanced access to overseas markets, enhanced predictability about regulation in key markets and will set a useful benchmark for WWTG observer countries and other non-members. “I’m pleased that New Zealand has marked its year as chair of the WWTG by the negotiation of this Protocol”, said New Zealand Trade Minister Tim Groser. "Georgia has been very famous for its wine. It was confirmed a few years ago that Georgia is the cradle of wine, with a history going back more than 7,000 years. We have 500 types of grapes endemic to Georgia and 100 types of wine". Last year, about 4 million tourists visited Georgia, almost equivalent to our population. Tourists come from everywhere, but the majority is from Europe. 2,500 tourists came from Korea last year. 28.03.2013 (Hvino News). Two Georgian wine producers are allowed to export to Russia: Kindzmarauli Marani and Dugladze Wine House. Russia's regulator Rospotrebnadzor gave the "green light" to these two Georgian producers for the supply of wine to Russia, Russian news agency Interfax reported today. "The question has been fundamentally resolved. They are allowed to prepare industrial batches," the head of Rospotrebnadzor, chief sanitary doctor of the Russian Federation Gennady Onishchenko said on Thursday. According to the head of Rospotrebnadzor, over 40 types of alcoholic beverages of the two companies are now registered in Russia. After the new government came to power in Georgia last autumn, talks started between Russia and Georgia about lifting the Russian embargo on Georgian wine and mineral water. The ban was introduced in 2006 shortly after Georgia accused four Russian diplomats of espionage, but came formally as a decision by Russia’s consumer safety agency Rospotrebnadzor to ban wine from Georgia and Moldova because of impurities. Later Russia also banned Georgian mineral water. 27.03.2013. Isabelle Legeron - the first French female Master of Wine, Travel Channel presenter and founder of RAW artisan wine fair - has launched her own natural wine, Lagvini. Lagvini is the product of an exciting joint venture between Isabelle and Eko Glonti, who met and became close friends while filming for Isabelle's show, 'That Crazy French Woman in Georgia' for the Travel Channel and decided to go into business together, to produce Georgian fine wine. Lagvini is a natural, orange wine, fermented and aged in kvevri - traditional Georgian clay pots buried deep underground. This ancient winemaking method, from 6000 BC, is the oldest in the world. The wine is made from organic Rkatsiteli grapes grown in Kakheti, eastern Georgia, in the foothills of the Caucasus. The winery works closely with local, artisan grape growers, using indigenous grape varieties and ancient winemaking techniques, to promote sustainable Georgian farming and preserve its rich cultural heritage. 27.03.2013 (Hvino News). Chairman of National Wine Agency Levan Davitashvili said at yesterday's briefing that the Agency will host the second delegation of Russian Rospotrebnadzor's officials on April 1. A 6-member delegation would arrive in Tbilisi to inspect 40 companies. According to Mr. Davitashvili, the delegation will be divided into three groups, as enterprises located in three west Georgian regions of Racha, Adjara and Samegrelo will be visited. According to Davitashvili, companies which have been approved are now registering for export and the majority of them are finished submitting the necessary documents. "As far as we know, there is great interest and demand in the Russian market and in some cases the supply prevails. In this case, we will not care only about volumes because the quality should be maintained. The role of the government will be finished after companies’ registration is completed. 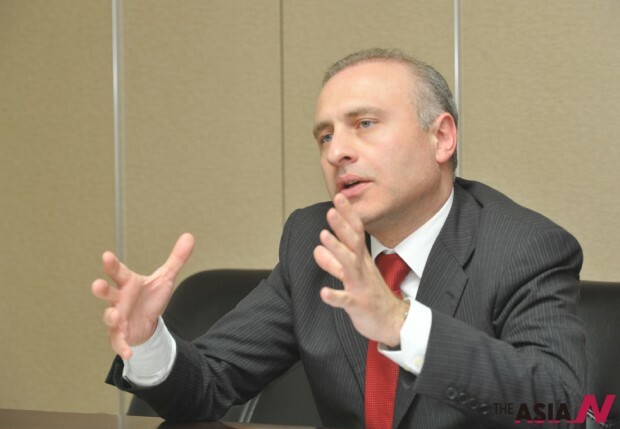 Later we will help companies only in communication," - Levan Davitashvili notes. 26.03.2013. The Federal Consumer Protection Service is looking to allow imports of some Georgian wines and brandies in the next few days, its chief Gennady Onishchenko said Tuesday. "These products have been registered, and tests show they comply with our requirements," he said, Interfax agency reported. According to Onishchenko, the pending entry of 22 types of Georgian alcoholic beverages into a state register will open the door for their imports. The products will be 17 wine brands and five brandies, he said. Work is ongoing to give the go-ahead to mineral water from the country, he added. The Federal Consumer Protection Service is about to authorize wine and brandy imports after it sent inspectors to examine quality standards at several Georgian companies in the industry in February and March. 25.03.2012 (Hvino News) Representatives from the Ministry of Economy and Sustainable Development of Georgia, the Embassy of Poland in Georgia and Polish businessmen say that the economic relationship between Poland and Georgia in the wine sector is improving. “Poland is the leading importer country of Georgian wine. Its export to Poland is increasing year on year and reached a total value of USD 2.7 million in 2012, which is 21 percent higher than the data of 2011. Trade relations between the two countries are developing and improving,” said Genadi Arveladze, Head of the Foreign Trade and International Economic Relations Department at the Ministry of Economy and Sustainable Development of Georgia, as quoted by The Financial. 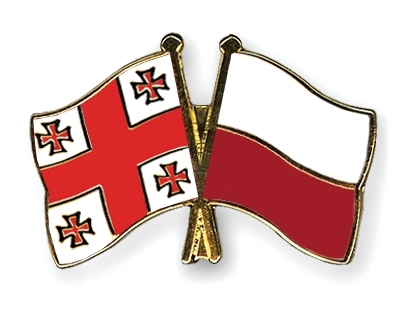 “It is also notable that regional cooperation between Poland and Georgia is very active nowadays. This is proven by the fact that there are seven twinned cities between the two countries. We will be seeing improvements in bilateral cooperation in the fields of agriculture, energy, the environment, tourism, attracting investments, culture and healthcare. The joint Georgian-Poland intergovernmental commission on economic cooperation affairs has been working on these issues since 2010,” Arveladze said. 24.03.2013 (Hvino News). Georgia is participating in ProWein 2013, one of largest wine fairs in Europe being held in Dusseldorf, Germany on March 24-26. David Kirvalidze, Minister of Agriculture of Georgia, took part in press conference held today at ProWein. Press conference, organized by Georgian wine industry representatives including National Wine Agency, Georgian Wine Association, and private companies, was attended by over 30 representative of international mass media accredited at ProWein. Minister of Agriculture briefed the journalists about the export potential of Georgia's wine industry, and its role in national culture. He introduced the government's general economic policy and new approaches in agriculture. 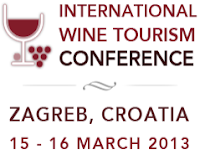 22.03.2013 (Hvino News) Georgia successfully participated in 5th International Wine Tourism Conference (IWINETC) in Zagreb, Croatia, on 15 - 16 March, being also one of main sponsors of the Conference (read more: Georgia to sponsor wine tourism conference in Zagreb and Georgian wines at IWINETC 2013 in Zagreb). 22.03.2013 (Hvino News) Wine producer Teliani Valley has received funding of $ 2 million from the US Overseas Private Investment Corporation (OPIC) as second tranche. Teliani Valley has been allocated an $8 million loan package to finance the development of its processing equipment, purchase new vineyards and increase export. The transaction was carried out on the basis of the $15 million worth project, drawn up by the parties in 2011. Of this amount, a long-term loan of $ 8 million will be provided by OPIC, and $7 million invested by the Georgian company itself. The annual interest rate of the loan is 5.5% over a 10-year term period. Teliani Valley also uses $7 million from its own private funds to further develop the planned projects. The first tranche of the project worth $ 5 million was released in January 2012 and spent for the construction of a new venture for the production of champagne and development of grape farms. The second tranche will cover the development of the tourist course of the company, expansion of wine production and export growth in the U.S.
OPIC is the largest U.S. government organization that reports directly to Congress and contributes to the development of private business backed by American capital in different countries of the world. 25% of Teliani Valley belongs to American investment fund Firebird Avrora. 22.03.2013. The wine consumption market in China continues to show its strong potential for growth after it became the world's fifth largest wine consumer in 2011. While France remains China's primary supplier of imported wines, followed by Australia, according to the London-based International Wine and Spirits Research Company, wines that are new to China have also been making a splash in the market over the past few years. The late-comers to the scene include wines from Georgia, Austria, Greece, Moldova and India. While wine consumption among Chinese is mostly driven by big brands with a focus on price, wine importers and distributors hope to see the newer labels make a name for themselves here. Georgia is one of the world's oldest wine producing regions. Officially introduced to China with the Embassy's blessing in March 2011, Georgian wines, from the country in the Caucasus region of Europe, now have about 20 brands available on the Chinese market, and can be found in wine retailers such as the high-end club of Ontime in Beijing's Friendship Hotel in Haidian district and the Charming Wines Company in Chaoyang district, which will hold weekly Eastern European wine tastings in Sanlitun starting in May. 19.03.2013 (Hvino News) On March 24-26 Georgia will participate in ProWein in Dusseldorf, Germany - one of largest wine fairs in Europe. Together with the National Wine Agency, 12 companies will be represented at Stand B52 in Hall 6. David Kirvalidze, Minister of Agriculture of Georgia, is planning to attend the event. In recent years Georgia has been active participant of ProWein. In 2013, the following companies will be present at ProWein: Besini Company Ltd., Corporation Georgian Wine, Georgian Wine Association, JSC Corporation Kindzmarauli, JSC Telavi Wine Cellar, JSC Teliani Valley Wine, Kakhetian Traditional Winemaking, Kakhuri Ltd, Schuchmann Wines, Tbilvino, Tiflisi Marani Ltd, Wine Man Ltd., Winery Khareba Ltd. They will be showing dozens of wines including unique and indigenous wine types. Tasting of Georgian wines will be opened at Georgian stand. In the framework of the wine fair, press conference with David Kirvalidze, Minister of Agriculture of Georgia, Levan Davitashvili, Chairman of National Wine Agency, and representatives of the Georgian Wine Association will be held on 24 March at 11:00 AM. This high-level event will provide media with an exclusive insight into the Georgian wine industry. 19.03.2013 (Hvino News). Russia said Monday that it may postpone new inspections of wine and mineral water producing plants in Georgia, in a hold-up that threatens to further drag out the resumption of imports to Russia. Consumer right watchdog Rospotrebnadzor accused Georgia of failing to provide the necessary package of documents required for the follow-up visit by Russian specialists. It also said that Georgia has added more companies to its list for inspection, according to Russian news agency RIA Novosti. Further complicating the process of resuming imports, Georgian wine and water producers last week said they were unable to supply product specimens to Russia due to difficulties in obtaining visas for company representatives. 17.03.2013 (Hvino News). Georgia is sending a delegation of farming officials to Moscow this week to look into the progress of efforts to resume the export of Georgian wine, mineral water and fruit to the Russian Federation. The Georgian delegation will visit Moscow to discuss with the Russian food security watchdog leadership issues of import of agricultural products to the Russian market, according to Giga Kurdovadze of National Food Agency, Georgian Ministry of Agriculture. He said the visit is planned after March 20 but no exact date was mentioned. The group consists of 7 specialists including veterinary plant oversight bodies representatives. 17.03.2013 (Hvino News) 12 Georgian natural wine makers are participating in The Real Wine Fair in London, which is also attended by the head of Georgia's National Wine Agency Levan Davitashvili. John Wurdeman of Pheasant’s Tears winery is scheduled to present seminar on “How tradition has become the cutting edge of Georgian wine” on Sunday 17th March at 2.00 pm. Georgian winemakers will be bringing their inimitable brand of Georgian hospitality to Terroirs Wine Bar for one night. Terroirs is delighted to host its first Georgian “Supra”. This gastronomic event will take place on Tuesday 19th March at Terroirs Wine Bar, 5 William IV Street, WC2N 4DW. The meal starts at 7.30 pm and will consist of wines from all the growers present accompanying small dishes featuring a wide array of typical Georgian delicacies. The Real Wine Fair is an artisan growers’ event featuring small wine growers who work organically and/or biodynamically. It is being held on 17th – 18th March 2013 at Tobacco Dock, Wapping, E1W 2SF. More information here. 16.03.2013 (Hvino News) Officially accredited test laboratories of Russia, Ukraine and Belarus have confirmed high quality of Georgian wine, according to Madona Koidze, Chairperson of Georgian Consumer Federation. The Inter-Republican Confederation of Consumer Societies (Konfop) proposed the joint tests at the Russian initiative, she said on Friday. The confederation unites 42 leading consumer rights organizations of Russia, Ukraine, Belarus, Georgia, Kazakhstan, Kyrgyzstan, Tajikistan and Uzbekistan. “We were ahead of the authorities – we have purchased wine produced by Bagadoni and Askaneli Brothers and Sarajishvili brandy and held joint tests at accredited laboratories of the three countries. Tests showed the beverages were of high quality and met safety norms,” Koidze said. In her words, Konfop board chairman Dmitry Yanin is a member of the advisory council of Rospotrebnadzor, which means Russia will learn the test results. 16.03.2013 According to the Ministry of Agriculture and the Department of Statistics, the number of vineyards in Georgia has decreased in recent years. Under the former government some farmers began replacing grapevines with watermelons and other fruits because the wine market was so unprofitable. This eventually damaged the production of grapes and consequently of wine and spirits. Now that Russia has rescinded its ban on Georgian wine there is the prospect that Georgian wine exports will significantly increase. Increasing wine production to meet this growing demand will be a challenge for the Ministry of Agriculture and local governments in the wine-growing regions of Georgia. 14.03.2013. According to the forecast of the companies interviewed by Georgian radio, Georgian wine sales will begin in the Russian market in a few months. Kindzmarauli Marani's director says that the next step after inspection is products registration on the Russian market, but this process could last until April. It is expected Georgian wine to appear on Russian store shelves by the end of next month. Dimitri Lebanidze notes that this year the company plans to export about 300 thousand bottles and negotiations with two distribution companies entered the final stage. Lebanidze still considers Georgian wine as a rival in Russian market and says that his company intends to exploit all the big cities of Russia. As for prices, the average sale price will start from 3 USD and on the store shelves wine price will reach 10 USD. Askaneli Brothers is also going to start sales on the Russian market in the near future. As the company's founder said, the next stage after inspection is products registration. According to Jimmy Chkhaidze, the company is in talks with its partner distribution company, but the amount of wine that is expected to be exported to the Russian market, is not known at this stage. The company plans to sell products in every major city. Askaneli Brothers products will be meant for average income segment, but its cost on the Russian store shelves is unknown. 14.03.2013. One of the benefits of writing a wine column is it is mostly subjective. Aromas and flavors can be as personal as one's taste in abstract art. However, on very rare occasions, my enthusiasm can supplant specific details. Such an error was brought to my attention last week by alert reader Christopher T. He read my column on Greek wines and took exception to the first sentence, "Greece is considered by many to be the birthplace of wine." He correctly noted that while the Greek wine industry dates back to around 4,000 B.C., there is evidence of a thriving winemaking trade in and around the area that is now known as the Republic of Georgia as well as parts of Turkey (that were formerly Georgian) that date all the way back to 8,000 B.C. 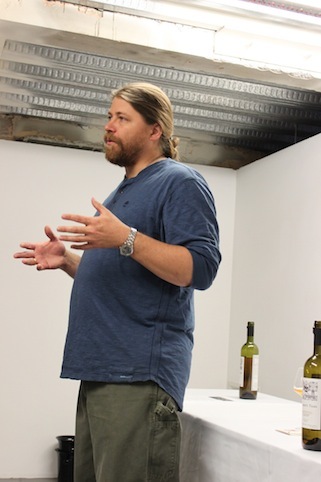 To support his point, he referenced author Patrick E. McGovern of the University of Pennsylvania, whose books "Uncorking the Past: The Quest for Wine, Beer, and Other Alcoholic Beverages" and "Ancient Wine: The Search for the Origins of Viniculture" explore the cultural and economic evolution of ancient Georgia (and other areas) though wine. 14.03.2013. Georgian wine and mineral water producers cannot supply specimens of their products to Russia due to difficulties in obtaining visas for company representatives, Georgia’s National Wine Agency said Wednesday. Earlier Russia’s chief sanitary doctor Gennady Onishchenko, who heads the consumer rights watchdog Rospotrebnadzor, said he asked the Russian Foreign Ministry to help Georgian wine and water suppliers to streamline the procedure of delivering product samples for registration in Russia. He said only one Georgian manufacturer has submitted specimens so far. 13.03.2013. David Manjiashvili slipped on his high-tops early one morning, intent on finally getting his father off his back by going for what would be the first of a program of jogs to reduce his expansive stomach. As he shut the front door, Manjiashvili met his neighbor, who was coming home after a long night of celebrating and wanted to continue. Manjiashvili resisted the invitation, explaining that he was going for a run, but his neighbor was relentless. "Just one," he implored. There is never "just one" in Georgia. Needless to say, Manjiashvili never went jogging again. In Indian mythology Lord Rama had to undergo a 14-year exile for no fault of his own. Georgia, one of the States of the erstwhile USSR had to suffer half the sentence only as the wines that were exiled in 2006 from Russia will now be allowed to enter as Russia announces lifting of the ban which crippled Georgia’s wine economy as 80% of its wine production was then shipped to this market. Head of AGC/Hvino interviewed by Britain's "Just Drinks"
07.04.2013 (Hvino News) On March 11 the British beverage industry's leading online resource Just Drinks published two articles on Georgian wine: "Georgian Wine Has Moved On Since Russia Ban" and "Georgia-Russia: Winemakers realistic as export ban set to be lifted". In the first article, Just Drinks is publishing answers of Levan Davitashvili, head of Georgia's National Wine Agency, to the British news resource's questions. In the article Just Drinks is also quoting Alexander Kaffka, publisher of Hvino News. Full text of article "Georgian Wine Has Moved On Since Russia Ban" by Andy Morton follows below. When Russia closed its borders to Georgian wine in 2006, it was a bitter blow for the former soviet republic's industry. Russia accounted for around 80% of Georgia's wine sales. But now that the ban looks set to be overturned, Georgia's wine representatives are not as excited as you might expect. That's because in the past seven years Georgia has found other countries to focus on. 12.03.2013. Marani participated in Georgian wine tasting organised by CBI together with Vino Revue, the leading wine magazine in the Czech Republic. The tasting was preceded by a master class showing different wines and was presented by Mr. Ivo Dvorak, 11th fold Champion Sommelier from the Czech Republic. The Czech wine lovers showed an enormous interest to attend the master classes, but only the half of the people registered were allowed to actual presentation (40 people). This interest in Georgian wines was also evident during the actual wine tasting when over 200 visitors, mostly the tradesmen, came to taste Georgian wines. 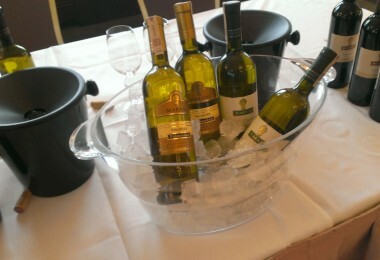 The reactions were very positive due to the high quality of the presented wines. The following of Marani wines attracted the most of public attention: Mukuzani 2009, Rkatsiteli Chardonnay 2012, Saperavi 2012, Tsinandali 2009, Satrapezo Saperavi 2011 and Kindzmarauli 2011. 12.03.2013. Georgia has not confirmed its readiness to receive the second team of experts of Rospotrebnadzor (Russian federal supervisory agency for consumer goods quality), the chief sanitary doctor of Russia Gennady Onischenko said on Monday. “We now prepare the second team for the inspection. We have already declared that we are ready to arrive in Georgia on 25 March, though we have no answer from Georgian side”, Onischenko said. The first team of the Russian experts inspected Georgian wine and mineral waters’ producing companies from 25 February to 1 March. The 36 wine producing companies and 4 mineral water producing companies are allowed to present samples to be registered for the Russian market. Russia has lifted a seven-year ban on Georgian wine imports via a decision to allow 36 Georgian wineries to register their products in the country. The wines from the former Soviet republic will go on sale in Russia in May. The decision was made after Russian inspectors carried out the first round of sanitation checks in Georgia, according to Russia’s public health chief Gennady Onishchenko. Belarus to produce Georgian wines under franchise? 11.03.2013. (Hvino News) According to Belarus national television, the Minsk Sparkling Wines Factory is to produce Georgian wines under franchise. The video clip form Belarus television can be found below (in Russian). Indeed, the website of Minsk Sparkling Wines Factory has a section "Wines of Georgia". The section lists several types of wines, including brands such as Saperavi, Alazani Valley, Suliko, Tamarioni and others. Interestingly, each wine brand is available in several versions of sugar content such as semi-dry, semi-sweet. No mention of Georgian franchise owner's company name could be found on website of the Belarussian factory. 10.03.2013 (Hvino News) Gennady Onishchenko, head of the Russia's consumer protection watchdog Rospotrebnadzor and chief public health official, confirmed that he received an invitation to visit Georgia from Ilia II, Georgian Catholicos-Patriarch, during his recent visit to Moscow. "This invitation has been repeated more than once. I accepted this invitation with gratitude and respect, regardless of the way the events develop," he said. "As for a particular date for a visit, I expect that it might take place in a foreseeable future," Onishchenko told news agency Interfax on Saturday. "In any development of the situation, I believe the role that the Holiest and Gracious Catholicos Ilia II plays in modern Georgia's history is hard to overestimate. It has a huge positive effect aimed at consolidating the nation and helping it to choose the right way for development, leaning on the immense and difficult historical experience that the Georgian nation possesses," said Mr. Onishchenko. Moscow and Tbilisi agreed on a mechanism to resume wine and mineral water imports from Georgia to Russia at negotiations in Moscow in early February. 09.03.2013 (Hvino News) Levan Davitashvili, head of National Wine Agency of Georgia, believes that return of Georgian wine to Russia will help to penetrate markets of Western and Eastern countries. On Friday, in the program “Arguments” of Georgian TV, Mr. Davitashvili said that the main thing now is to maintain production quality control to cater to the growing competition every year in the wine market. On 25th of March, Georgia expects the visit of the second group of experts from Russia's Rospotrebnadzor during which the remaining wineries which want to export to Russian market will be inspected. Earlier the head of National Wine Agency declared that supply of Georgian wine and mineral water to Russia will be resumed in the beginning of May. Georgia hopes to export to Russia an estimated 8-10 million bottles of wine a year, Levan Davitashvili said. He added that “this is equivalent to about 25 percent of the overall amount of Georgia’s wine exports.” Georgia exports its wines to 40 countries. 08.03.2013 (Hvino News). 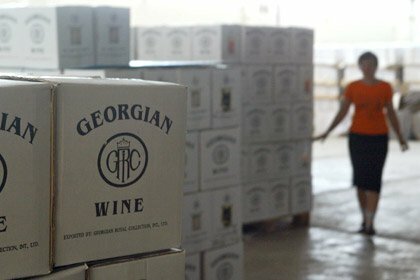 Georgia will send another delegation to Russia on March 18 to explore re-entry of Georgian wines and mineral waters to the Russian market, the Agriculture Ministry said on Thursday. Georgia sent its first agricultural delegation to Moscow for talks in early February. Russia has also scheduled to send its second group of experts to Georgia for on-the-spot quality inspections of Georgian wines and mineral waters, after an initial round of inspection in February. Genady Onishchenko, head of the Russian consumer goods quality watchdog Rospotrebnadzor, would visit Georgia but a date had not been decided, the Agriculture Ministry said. Wine: Alaverdi, Askaneli Brothers, AxalSheni 2005, Badagoni, Bagrationi 1882 , Batono, Chateau Mukhrani, Corporation Georgian Wine, Corporation Kindzmarauli, Eniseli - Bagrationi, Georgian Wine House, Giorgi Mirianashvili’s Chelti, Gomi, Gruzvinprom, GWS, Kakhetian Traditional Winemaking, Kakhetian Wine Cellar, Kakhuri, Kimerioni, Kindzmarauli Cellar, Manavi Wine Cellar, Marniskari, Ozhio Cellar (Alaverdi Monastery), Sarajishvili, Schuchmann Wines Georgia, Shumi, Tbilisi Cellar, Tbilisi Wine Cellar, Tbilvino, Telavi Wine Cellar (Marani), Teliani Valley, Tsinandali Old Wine Cellar, Vazi+ , Wine Company Dugladze, Winery Khareba, Winiveria. The desire to present its products on the Russian market was expressed by 93 Georgian enterprises. 08.03.2013. In a major sign that fences are being mended between the neighbours, Georgian producers of wine and bottled water are set to finally resume exports to Russia after almost seven years of halted trade, after consumer watchdog Rospotrebnadzor approved dozens of companies to resume the traditional sales. Rospotrebnadzor gave the go ahead for 36 Georgian wine makers and four mineral water producers to export their products to Russia on March 6. Agency head Gennady Onishchenko said that Russia has granted the approval following inspections of the companies. 07.03.2013. An interview with John Wurdeman of Pheasant’s Tears posted by British wine importer Les Caves de Pyrene. Kvevri? Qvevri? Which is it? We are spelling it “Qvevri”. There was much discussion on this; a few German importers prefer the Kv rather than Qv but I have had the Travel channel CNN, BBC and Jancis Robinson’s upcoming books on varietals and wine atlas all use the Qv spelling which the Georgian wine producers are using, so Qvevri. The word “Qvevri” – does it literally mean amphora or does it derive from something else? No, it doesn’t mean amphora. Amphorae were often used for transportation, or storage above ground – they often had handles and were not permanent. Qvevri is a Georgian vessel dating back over 8,000 years predating Greco-Roman traditions of winemaking. A qvevri was totally buried in the ground and not used for transportation, it was used for fermentation and storage of wine, and, being totally immersed in the earth gave it naturally stable temperatures, advantageous for both fermentation and storage. It is a vessel unique to Georgia (oldest examples date back 8,000 years) although similar interpretations are found throughout the ancient Near East and more recently, (2,000-3,000 years ago) in Italy, Spain and Portugal. The vessels used in western Europe culture are normally above ground or partially buried. Qvevri usually have a beeswax lining inside and a lime encasement outside. The few European producers that have borrowed this technology from Georgia – such as Josko Gravner – still call the vessel “Amphora” (or Anfor) on their labels, which bothers the Georgians. They feel it sounds like a Roman or Greek cultural attribute whereas this is much older and indeed derives from Georgia. 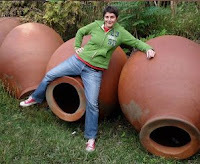 The Friuli/Slovenian producers, including Gravner, bought qvevri in Georgia and learned their open-fermentation, extended skin maceration techniques here, so we hope over time to convince them to call the vessels qvevri rather than amphora! 07.03.2013. Sanitary inspectors in Russia look set to lift a ban on Georgian wine and mineral water imports imposed in 2006 for reasons that probably had more to do with politics than hygiene. The end of the embargo would mark a small step towards the restoration of ties between the two countries that fought a war in 2008 over Georgia’s breakaway regions of Abkhazia and South Ossetia. Doctor Gennady Onishchenko the head of Rospotrebnadzor, Russia’s consumer protection watchdog, said 36 Georgian wine producers could submit samples of their products for inspection – a prelude to a case by case lifting of the embargo, RIA Novosti reported on Wednesday. 06.03.2013 (Hvino News) “Georgian wineries and factories successfully passed their checks in order to appear on the Russian market, and we expect further checks on March 25,” Levan Davitashvili, head of Georgia’s National Wine Agency, told reporters in Tbilisi today. The Russian consumer safety agency Rospotrebnadzor confirms that 36 Georgian wine companies and four mineral water producers are ready to enter the Russian market, effectively lifting a seven-year ban on imports from the former Soviet republic. A total of 93 Georgian companies have sought to resume shipments to Russia, and 40 more firms may be inspected as part of a second round of health checks, Davitashvili said. On Wednesday the agency published a list of products which have been approved after the inspection procedure. Among the approved products there is well-known mineral water Borjomi; among wines are Bagrationi 1882, Badagoni, Kindzmarauli Marani, Sarajishvili, Teliani Valley and others (for official list in Russian, click here). 06.03.2013 (Hvino News) Russia will allow about 200 Georgian wines from 36 wineries, and mineral water from four producers, to register their products. This will put an end to seven-year ban on imports from the former Soviet republic. The decision was made following the first round of sanitation checks carried out in Georgia by Russian inspectors, the state-run news service RIA Novosti said, citing Russia’s public health chief, Gennady Onishchenko. Rospotrebnadzor experts have so far inspected 37 Georgian wineries out of 93, which had expressed their wish to resume imports. The remainder will be checked during the second probe, which may start on March 25, Onishchenko said, adding the watchdog will also make a decision on whether to import chacha, Georgian grape brandy. “During the first inspection, 37 alcohol-producing enterprises and four mineral water producers were checked. We will not admit one of the alcohol producers [to the Russian market] because things must be put in order there. All the other 36 enterprises can start registering their wines and brandy [in Russia],” Onishchenko said. 06.03.2013. The Russian-Georgian Center of Economic Development has expressed hope that Georgian wine will soon return to Russian markets and advised to pay no attention to protests voiced by President Saakashvili. 05.03.2013. “Voleur d'amphores, au fond des criques” (thief of amphorae deep into the coves), sang Bashung, and little did he know that he was also writing the soundtrack of my life at the time; it was so fitting and as hopeless. D'estrade en estrade, j'ai fait danser tant de malentendus, des kilomètres de vie en rose… (From stage to stage, I made so many misunderstandings dance, miles of Vie en rose...) Between those disreputable nights where lies spiced up antics on the carpet and the days spent away from reality, an authentic dealer from Agde told me about the differences between true and false amphorae, their weight, their appearance, their handles. Near the white skin of the Consuegra mills whose vision made my nose sting, we admired these decorative “tinajas”* in which, just before the onset of stainless steel, wine growers from La Mancha developed their old wines, ultimately no worse than the new. J'ai fait l'amour, j'ai fait le mort (I made love, I played dead). “Aliam vitam, alio mores” (Other times; other customs), only faded photos remain, terribly jolly, excerpts from a body that was supposedly offered, smiles which were just as fake as the nights featured in Bashung’s song. I did, I answered a "mountain of questions". Moving on now. 04.03.2013. According to Georgian National Wine Agency, during February 2013 Georgia exported 1,350,000 liters of wine in 0,75 l bottles to 23 countries. Total exports as of February 2013 is 1,900,000 liters. This is 28% higher than during the same period of 2012. Top 5 export destinations for Georgian wines are: Ukraine, Kazakhstan, Belarus, Latvia and Poland, with Ukraine topping by 44% of total Georgian wine exports. Information (in Georgian) for wine producers regarding export to Russia can be found here. Important Notice: Effective 01.03.2013, Hvino News and Hvino-Новости are official information partners of Georgian National Wine Agency. 04.03.2013 (Hvino News) Georgia's Agriculture Minister Davit Kirvalidze said on Saturday he is confident that Georgian wine which is expected to return to the Russian market this spring will be of best quality. “I can see no danger in this. Georgian wine exports will have the same certificates as they do have today for 40 world markets. I see another danger: unfortunately, the wines may be falsified outside Georgia’s borders. That’s why we are working on this issue,” Kirvalidze told Rustavi 2 TV. He said Georgia’s agriculture ministry has its own proposals on the measures against falsified Georgian products. The second round of talks on the issue will take place on March 18, according to Mr. Kirvalidze. It is expected that the export of Georgian beverages to Russia will resume in May. 02.03.2013 (Hvino News) According to the Russian Foreign Ministry, Deputy Russian Foreign Minister, Grigory Karasin, and the Georgian Prime Minister’s special envoy, Zurab Abashidze, pointed out some positive changes in Russian-Georgian relations in recent months, during their meeting in Prague. Russian and Georgian top diplomats met on Friday to discuss visa regime, wine exports to Russia, direct flights between Moscow and Tbilisi and other issues. “Both sides are satisfied with the results, they are convinced that our unofficial contacts have a future. We tentatively agreed to hold the next meeting in May. Its location will be discussed later, but it might be Prague,” Karasin said after the talks. He described the meeting as “constructive,” saying that it allowed making a step forward on a number of practical issues, such as the visa regime and resumption of direct flights between the two states. A software engineer turned vintner brings ancient wine casks from his native Georgia home to the family farm; another family uses a slightly newer technique in their backyard vineyard. 02.03.2013. You can’t get enough of the large earthenware casks. They’re as tall as a man, they have the shape of huge eggs, like mythological creatures, and in a rather illogical way, stand on a very small and narrow base. The 21 fat-bellied wine casks − hand-made by expert craftsmen who inherited the trade from their forefathers − were brought by the Slutzkin family from Georgia, the cradle of wine culture and one of the first places where grapevines were domesticated. Local experts on the history of wine claim that wine was fermented in similar casks in the ancient Land of Israel, and the fermented product of its vines became famous among the nations of the region. 01.03.2013. One of Georgian winemakers revealed information in social network that Russia's largest supermarket Sedmoi Kontinent demanded 2 million USD from his company for selling its products. According to the entrepreneur, this system is very corrupt in Moscow. Management of Winery Khareba denies demand of a fee in exchange for the entry in the Russian retail chains. According to the company’s representative Beka Khergiani, they are holding talks with five largest Russian companies and no one demanded to pay "commission charges" from them. Khergiani notes that the Russian supermarkets have the same conditions of products entry as in other states of the former Soviet Union. "Nobody asked the commission charges, they have different requirements, regarding prices, which need to be within certain limits," – Khergiani says. However, in her words, many companies impose such a fee, including even Carrefour [editor's note: Carrefour is not operating in Russia - HN]. Hvino-Novosti is published in cooperation with the National Wine Agency of Georgia (click here for official announcement at the Agency's site). The new information resource will contribute to international promotion of Georgian products to Russian speaking audience, especially in the view of resumption of Georgian wine export to Russia. 01.03.1013 (Hvino News). Russian consumer watchdog Rospotrebnadzor head Gennady Onishchenko told Russian media on Thursday that he might visit Georgia. Mr. Onishchenko said that he planned to visit Georgia after his experts return to Moscow. 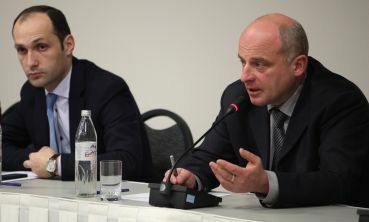 "It might happen, though Onishchenko himself is to make the decision," - the Georgian agriculture minister said David Kirvalidze stated. Experts from the Russian consumer protection service would continue inspecting wineries and were scheduled to leave Friday, the minister said. "As per the agreement, the Russian experts will not make a statement on the visit until they return to Moscow," Kirvalidze said. In seven to ten days, a second delegation will arrive in Georgia to inspect the remaining factories willing to export wine to Russia, he said. "Then the inspection will be completed entirely," he said.